Get creative with our 150mm wide full-colour logo printed ribbons. 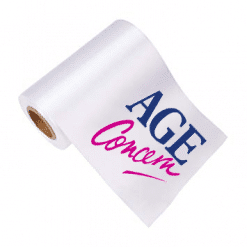 We offer a double-faced white satin ribbon printed with a permanent textile dye perfect for full-colour logo printing. Our ribbon printing service can print on our beautiful satin 6 inch wide ribbons. Custom printed and ideal for Grand Openings, Large Scale gift wrapping, Super Size trophies, Big Hampers and Company Promotions this beautiful silk to the touch satin ribbon is luxurious and prints wonderfully to your Pantone colours. You will need to email us your print file once you have placed your order. 150mm wide printed ribbon, printed ribbon in the UK are high-quality double-faced satin ribbons that can be printed with your own design of text and/or logos.